FRANKFORT (Oct. 8, 2018) — October is Farm To School Month, and here in Kentucky we have plenty of reasons to celebrate. Our hard-working Kentucky Department of Agriculture (KDA) staff has recruited 907 schools in 77 school districts to participate in our Farm To School program. Some school districts are the largest food procurers in each county, so this program provides many benefits to Kentucky farmers and students alike. Farm To School programs in Kentucky are diverse, ranging from private schools like St. Peter and Paul’s in Fayette County to public schools like Bowling Green City Schools. They also include dozens of Junior Chef teams throughout the state. Junior Chef, a program we started in 2013, teaches high school students essential cooking skills while encouraging the use of local foods in their diet. Sullivan University has worked closely with the KDA to conduct the state Junior Chef tournaments and has generously offered more than $821,000 in scholarships for Kentucky students to pursue the career of their dreams. Kentucky is an incredible leader on this front, to the extent that the USDA has commended us for our program and selected Kentucky to host the first-ever regional Junior Chef competition last year. The Department granted us nearly $100,000 to enable us to host two major regional training events for farmers and school service authorities. We will soon issue 10 mini-grants for additional training, equipment, and other needs to help farmers with their farm-to-school marketing efforts. Our Farm To School program feeds not only the bellies of our students, but also their minds. The KDA is a proud supporter of 78 school gardens across our state. When most folks don’t know the difference between a soybean and a green bean, the hands-on agricultural experience provided by a school garden is more important than ever before. The economic impact of our program is considerable. According to the Farm To School Census, Kentucky schools spent $8.8 million on local food in 2015. That amount is something to be proud of, but when you take a look at how much the average school district spends on local products, it amounts to only 3 percent of their budget. We can do better. Even a small percentage increase could yield big opportunities for Kentucky farmers. If you are interested in learning more about how you can connect with local producers in your area, please contact the KDA’s Farm To School staff at (502) 573-0282. Farm To School is a win-win for our students and for our farmers. Behind all of our success are lunchroom staff who have a passion to provide fresh, local food to young people. This October, I hope you and your families will join me in celebrating the local foods in school lunchrooms across the state. 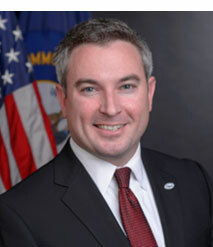 Ryan Quarles serves as Kentucky’s Commissioner of Agriculture. He was elected in 2015.